You can either deploy an SAP HANA instance on Azure Virtual Machines which goes up to the GS-5 virtual machines (GS5 VM) with 448GB of memory. The other way is to deploy SAP HANA instances on the AZURE large instances for SAP HANA. It is a physical center that is offered in locations in a data center by Azure specifications. 2) HANA instance can run on the non virtualized physical server and this server has been certified to meet the SAP TDI specs. 3) The data center that hosts this large instance machines will connect to your application servers that you deployed on AZURE Virtual Machines which is the Microsoft Azure public cloud off links. Starting from the bottom if you have a very small instance, SAP HANA one installation, you can deploy that on the Virtual Machines on Azure in the IS infrastructure service model. The SAP HANA one installation is a small instance which is around 100GB in size that fits nicely in the DS14_v tool Virtual Machine size. For the Business Suite or S/4 HANA application, they do not run on scale out model. You can only install them on the Single Node and so are referred to as single instance scale up scenarios. It can go from 400GB to 4TB in one single box. For BW applications you can install it in a multi-node scale out scale out model. If you install it in the single node you can go from 400GB to 2TB and in multi-node, you can go up to 16 2TB instances, put them together in one SAP HANA system and can go up to 32TB. SAP HANA can run non-production workloads on DS14 families up to GS4 provided that the HANA instances size on the non-production can actually fit into those Virtual Machines. If you are running production workload you can start with the GS5 Virtual Machines or you can go with the Physical server. All of these SAP HANA machines run with Premium Disk. The Developer Edition of SAP HANA is available to run on Microsoft Azure and you can easily provision an instance on HANA Developer Edition from a SAP Cloud Appliance Library, also known as CAL. It is a portal where SAP makes many of their product images available before launching and deploying onto public portals. 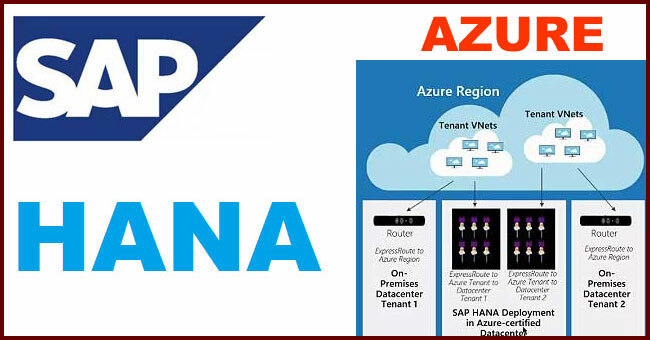 You can pick an image of a HANA Developer Edition and provide it with your subscription ID and management certificates that will allow you to deploy HANA Developer Edition instance onto your Azure subscription. In OLAP you can run up to 2TB in a single instance and up to 8 total of 32TB in a scale out multi-node configuration. With OLTP you can go up to 4TB in one single instance. The storage with these large instances are predefined, pre-configured because the ratio of storage, RAM and core counts are specified in SAP Tailored Data center Integration specs, that is the TDI specs. You can add additional storage by purchasing with Microsoft Additional Premium Disks in 1TB instalments. The Datacenter facilities currently available or the offerings currently available are US EAST and US WEST. Storage wise SAP HANA offers you NFS file shares or the administrator to mount on the HANA OS thereby providing storage services for the applications. Typically the storage capacity is four times the RAM size. In terms of Network, there is a Backend ExpressRoute connection between Azure IaaS network that hosts the large instances and the Virtual Machines on Azure IaaS Public Clouds. The connection bandwidth is 10Gbps. HANA on large instances server to server communications also occurs on the Microsoft backbone. It offers the highest availability of Public Cloud offerings. It can offer you at least one instance 99.9% of the time if you configure “High Availability Pair” of HANA Large Instances. So, if you have a primary instance of such a Large Instance server and configure identical configurations at a remote region and establish system replications then your availability can be at 99.99%. The Datacenter facility and the HANA hardware, storage and Network are managed by Microsoft whereas SAP Kernel, HANA Database, SAP Applications and NetWeaver are managed by the customer or partner. The OS is managed by both customer and Microsoft. The licensing of SAP HANA on Azure (large instances) is like an IaaS service where if you have a one year or three year contract the price for you gets significantly reduced. In terms of OS, it supports both Red Hat and SUSE. How to run SAP HANA non-production environment Azure? From the infrastructure wise layer given in the image below you can see the first numbered segment on the left refers to a Customer Datacenter with a HANA production instance deployed. On the bottom right side, you see a number of Virtual Machines labelled ECC Applications for QA and ECC Applications for DEV/TEST. They are the application server layers that you deployed on the Microsoft Azure Virtual Machines. On the upper right half you have two HANA instances deployed, one for QA and one for DEV/TEST and among them, QA is bigger. The table in the following image shows the certified SAP HANA products that are capable of running production and non-production workloads on Azure. The sizes of various applications that you may deploy are also listed here. The first question asked is whether it is a production or a non-production system. If it is a production system you follow the flowchart on the path on top leading through the diamond shaped boxes, but if it is a non-production system, you can deploy them on Azure Virtual Machines, provided that your workload is able to fit in GS series or DS series Virtual Machines. If it is a BW or S/4 HANA Applications smaller than 500GB you can propose GS5 Virtual Machines. If it is bigger than 500GB you need the smallest Large Instances of 768GB of memory and up to 2TB per instance. For this BW type of applications scalability up to 32TB is provided. For OLTP types of applications scalability up to a single instance of 4TB is provided. The system has to be highly responsive which means that it has to give a great performance. It has to be highly available, have the ability to protect any disaster event that occurred on the primary side of the Datacenters or Operations. It has to have the interoperability with the on-premises system because you may have another system that complements the SAP core products that you use in your enterprises. Those are the general requirements. You should also be able to migrate a production system onto Azure with minimum downtime. 2) A sample of the HANA single large instance is given below. You can see that on the left there is the Azure Iaas Virtual Machine where you install all your application servers and to the right, you have the SAP HANA large instances, in this case, it shows a HANA production machine. 3) The front end ExpressRoute between the customer and Azure VM is recommended to be a minimum of 1Gbps and the backend ExpressRoute is of 10Gbps. The storage offering here is via NFS. For SAP application server VM of 2 nodes- You will have an uptime SLA of 99.95%. Failover custom configuration, if possible. For SAP TDI certified HANA hardware of 2 Nodes- you will have an uptime SLA of 99.99%. You can have a single instance of Azure VM with Premium storage you will have 99.5% availability without any additional configuration required. Here, you see that an additional region is introduced and an additional SAP HANA large instance is installed to do system replications from the primary instance. The top primary region has two HANA instances. They are highly available and are accustomed together and the replication cluster uptime SLA is 99.99%. The DR system in the remote region has system replications configured. HANA does not do cascading replications, that is, you can see the red arrows in the picture below comes out of the primary instance and that instance is doing all the replications to the multiple secondary applications. If you have multiple QA systems either for the same applications or for the different applications you can deploy these across different regions. The benefit of having the QA systems deployed next to the production systems is that often you need to refresh these non-production systems with the production you reach. The yellow arrows on the right describe the refresh scenarios where you can pick up images very quickly from the nearby production instances and use that to refresh your QA system. BW scale out for HANA- on the rightmost box you can see the HANA nodes and with today’s technology you can have 16 of these each having 2TB capacity making a 32TB HANA system, and on the left, you have the app servers that gets deployed on Azure IaaS VM. Having the ability to automatically deploy some of the systems, in other words, scripted and automated Dev/Test Deployment. Automated Dev/Test shut down, that is typically you don’t run the development machines or test machines 24x7 all round the year and so if you want some idle time from this environment you can shut them down with the word deployed from VM, or for safe money because your computed resources are not charged if you don’t use them by shutting it down. Having the ability to run windows and Linux. Going to cloud, as it appeals to more customers, especially to those customers who are very sensitive about their data and feel cloud is a safe option. The site should be connected across premises or both on-premises cloud, having the ability to bridge the two premises because often you may be running your instance on premises yet you want to setup a DR instance on Azure. The ability to failover a DR site within a few hours. Minimum loss of transaction data should also be possible because it is necessary when you need to replicate data across the network. Transparently failover the user's conductivity to the new production’s DR environment, otherwise if the user needs to call the backend switch then they may need to change the host name in the client's code that will not be desirable. The ability to failback after you failover.